Bitcoin’s rate has grown by 50000% in the last 3 years. Its value was in single digit in 2012. Believe it or not guys, the current price of 1 Bitcoin is $17900. People who trusted Bitcoin and bought 1000s of BTCs in 2013 are millionaires right now. Bitcoin trading has become a serious business in 2017. If you want to swim with the Bitcoin tide and you’re ready to take a risk for making some quick bucks, you can invest your money in BTC. Bitcoin is an open-source cryptocurrency which you can buy or sell online with wallet apps. The only way to make a profit is to keep an eye on the Bitcoin price. When the price increases, you can sell the Bitcoin. If the price dips, you can wait for a few days before selling BTC. The price of the Bitcoin is not aired on Radio nor it is displayed on News channels. 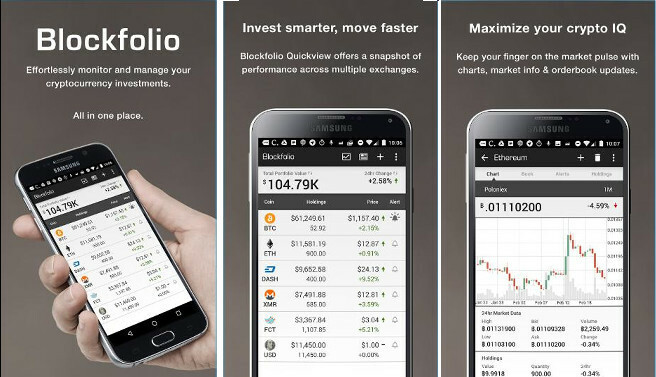 BlockFolio is an app that allows users to track their various cryptocurrency investments in one place. The app lets users set price alerts. It will display a notification when the currency value has reached the threshold the user has set. The BlockFolio app supports 1600+ cryptocurrencies. The app features a news reader module where you’ll find cryptocurrency news from various online magazines. Hence, you don’t have to download and install news apps to keep yourself up to date with the latest happenings in the world of digital currency. Users can get detailed information on their favorite currency and markets with the BlockFolio application. They can also see the historical data of the top cryptocurrencies. The BlockChain is the only Bitcoin wallet app that supports two-factor authentication. It lets users prevent unauthorized access to their wallets by providing an option to set a PIN code. The app has been given a clean chit by world-renowned security experts. Hence, you can consider BlockChain as a safe app. BlockChain app has an intuitive interface. It allows you to transfer or receive funds online. It supports QR codes and 22+ languages. The app ships with a currency converter utility. As BC is a popular app, 1000s of merchants accept payment with the BlockChain wallet. You can find merchants nearby you that support BC payment. 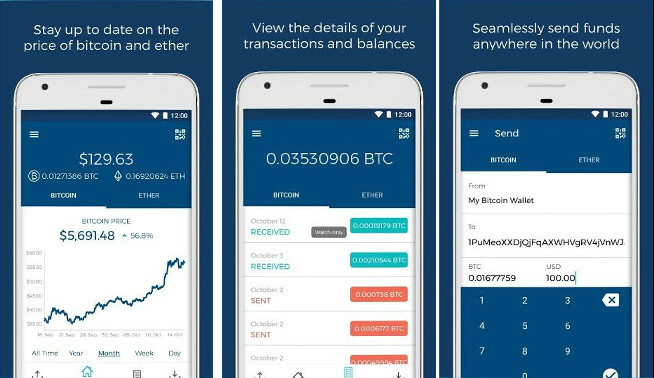 Coinbase is a free app with which you can buy and save LiteCoin, Bitcoin, and Etherium. 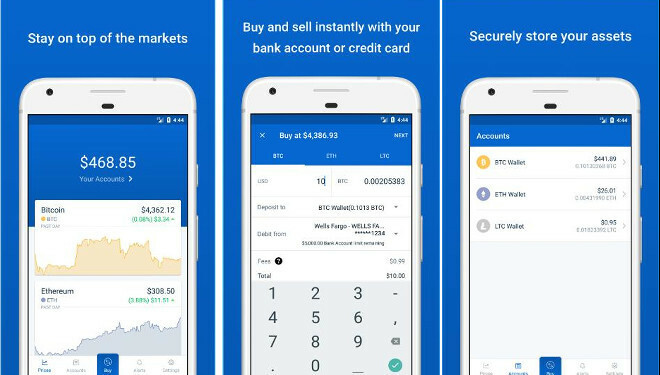 You can also transfer funds to the wallet of other Coinbase users with this app. Users can see the real-time price of their favorite cryptocurrencies in Coinbase app. They can also check out on popular sites like Dell, Expedia and 20000+ other sites with this application. CB has the option to set a passcode. If you’ve lost your phone, you can prevent unauthorized users from accessing your Coinbase wallet. Users can link their bank or PayPal account with Coinbase to make transactions faster. Coinbase is most popular bitcoin app in the App Stores. It is available for download in 32 countries. 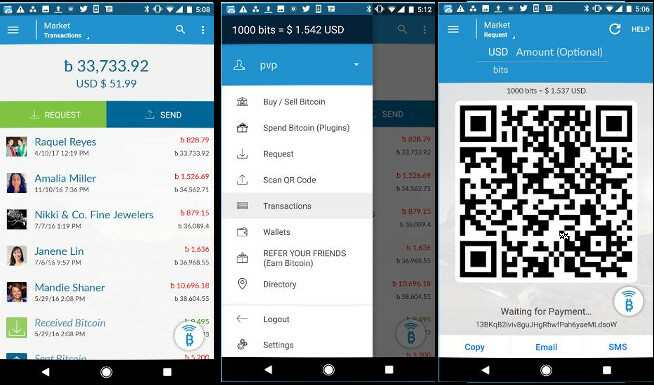 AirBitz is an open-source app through which you can buy and sell Bitcoins from the mobile phone. Creating an AirBitz account is easy. To register an account with AirBitz, you must enter your email address and password. AirtBitz remembers user’s bank accounts. Hence, you don’t have to enter debit or credit details while buying Bitcoins. The app lets you see your previous transactions. It can scan Bitcoin QR codes. If you’re using AirtBitz, you can generate a QR code and share it with the payer. 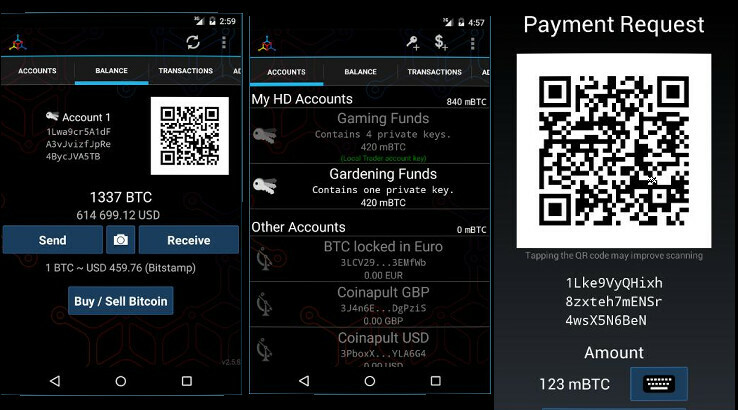 The payer must scan the code with a Bitcoin app to make a payment. The app provides a search utility to find transactions. It is lightweight and easy to use. According to its developer, MyCelium app is the simplest and most secure Bitcoin app. MyCelium doesn’t ask users to download Blockchain nor does it asks them to enter a phone number, email address or upload documents. When you run MC, you’ll see two options – restore a backup, create a new wallet. To get started with MyCelium, tap on the 2nd button. That’s it! The app will create and store a private key in your phone’s storage memory. The app generates your bitcoin address automatically. It also generates a QR code which you can share with other people. The QR code contains your Bitcoin address. Your friend must scan it with MyCelium or any other wallet app to transfer money. MyCelium allows users to see the list of their previous transactions. If you’re in the US or Canada, you can buy bitcoins with the MyCelium app. MyCelium supports KeepKey, Trezor and Ledger hardware wallets. Hence, you can save your bitcoins offline with this app. 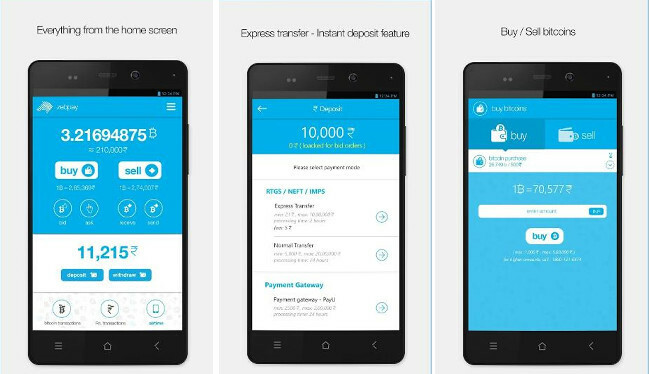 Zebpay is an app like Coinbase for buying and selling Bitcoins in India. It lets you buy BTC with a credit or debit card. Once you earn a profit, you can withdraw the money to your bank account with the Zebpay app. To use Zebpay, you must verify your phone number. You must also upload a copy of Aadhar Card and Pan Card. ZP supports NEFT, IMPS, and RTGS services. It allows you to add a Bitcoin rate widget to the home screen. To make sure that no one gets access to your wallet, Zebpay lets you set a four-digit security pin. ZP allows you to see the account statement and transaction history. It has the option to set a preferred currency unit. BTC mining is like finding a needle in a haystack and asking a noob to solve a complex puzzle. Well, you don’t have to be a geek to mine bitcoins. All you need is a powerful computer and a mining software. Can you mine BTC online? Yes, you can do but there’s a big risk involved in mining Bitcoins online. Nice Hash was a popular platform for mining BTCs but it was hacked last week. The hack resulted in people losing over 60 million USD. Conclusion: AirBitz, Coinbase, ZebPay, Blockchain, BlockFolio, and MyCelium are the best Bitcoin apps for iPhone and Android devices.